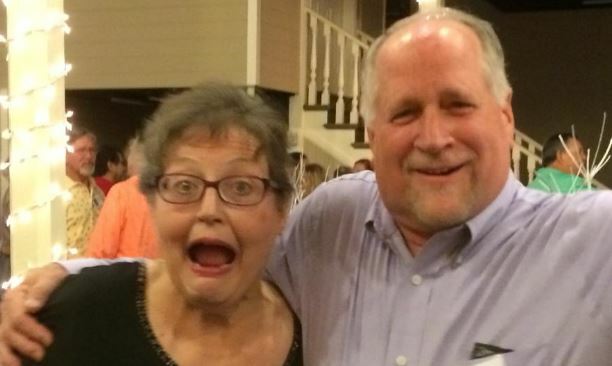 Sweet Martha won her battle with cancer at about 2:30 AM on Friday July 17, 2015. 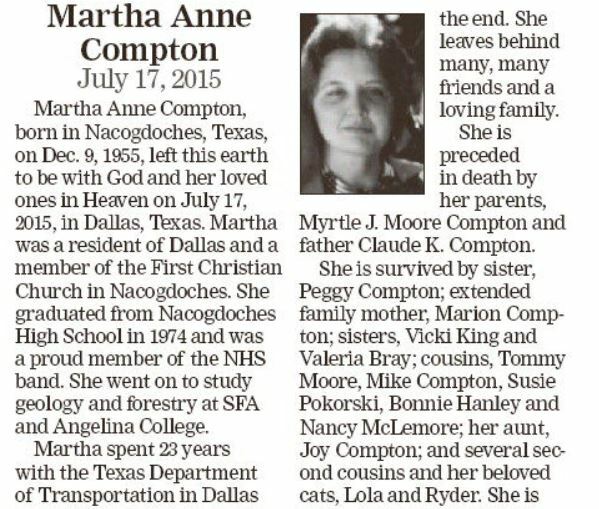 Martha Anne Compton, born in Nacogdoches, Texas, on Dec. 9, 1955, left this earth to be with God and her loved ones in Heaven on July 17, 2015, in Dallas, Texas. 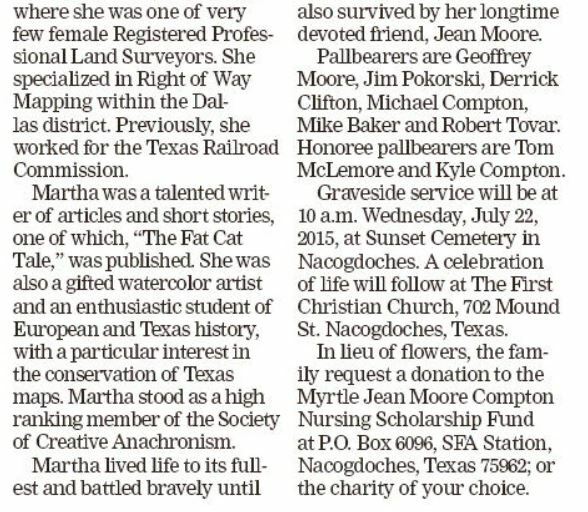 Martha was a resident of Dallas and a member of the First Christian Church in Nacogdoches. 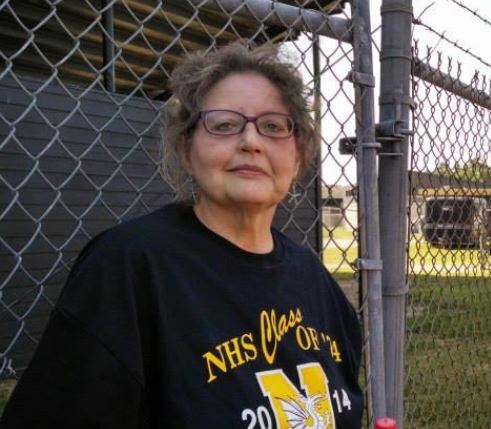 She graduated from Nacogdoches High School in 1974 and was a proud member of the NHS band. She went on to study geology and forestry at SFA and Angelina College. 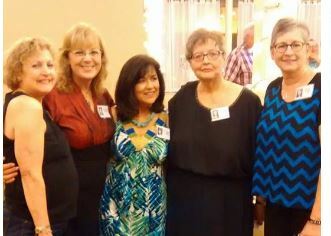 Martha spent 23 years with the Texas Department of Transportation in Dallas where she was one of very few female Registered Professional Land Surveyors. She specialized in Right of Way Mapping within the Dallas district. 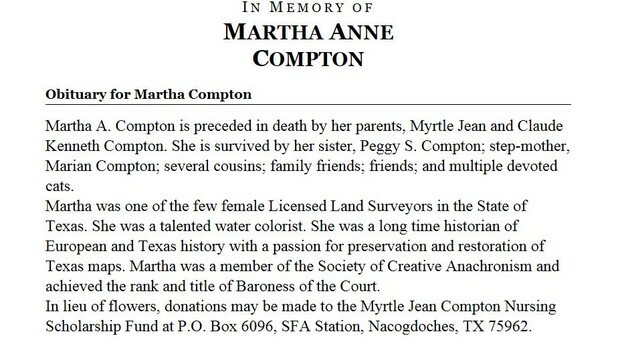 Previously, she worked for the Texas Railroad Commission. Martha was a talented writer of articles and short stories, one of which, “The Fat Cat Tale,” was published. She was also a gifted watercolor artist and an enthusiastic student of European and Texas history, with a particular interest in the conservation of Texas maps. Martha stood as a high ranking member of the Society of Creative Anachronism. Martha lived life to its fullest and battled bravely until the end. 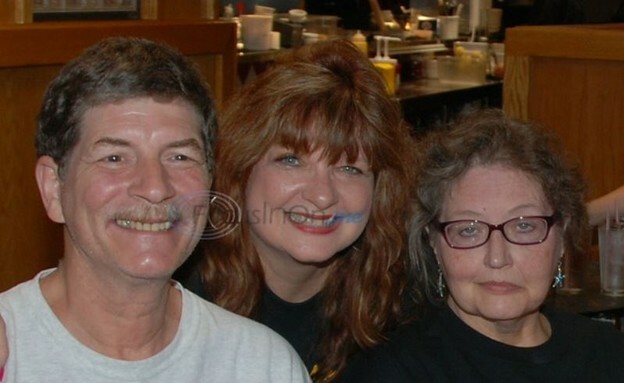 She leaves behind many, many friends and a loving family. She is preceded in death by her parents, Myrtle J. Moore Compton and father Claude K. Compton. 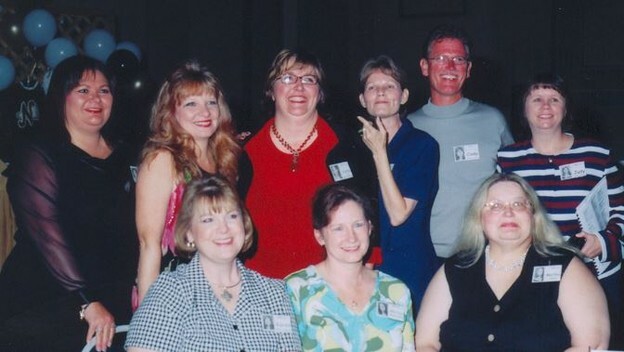 She is survived by sister, Peggy Compton; extended family mother, Marion Compton; sisters, Vicki King and Valeria Bray; cousins, Tommy Moore, Mike Compton, Susie Pokorski, Bonnie Hanley and Nancy McLemore; her aunt, Joy Compton; and several second cousins and her beloved cats, Lola and Ryder. She is also survived by her longtime devoted friend, Jean Moore. Pallbearers are Geoffrey Moore, Jim Pokorski, Derrick Clifton, Michael Compton, Mike Baker and Robert Tovar. Honoree pallbearers are Tom McLemore and Kyle Compton. Graveside service will be at 10 a.m. Wednesday, July 22, 2015, at Sunset Cemetery in Nacogdoches. A celebration of life will follow at The First Christian Church, 702 Mound St. Nacogdoches, Texas. In lieu of flowers, the family request a donation to the Myrtle Jean Moore Compton Nursing Scholarship Fund at P.O. Box 6096, SFA Station, Nacogdoches, Texas 75962; or the charity of your choice. 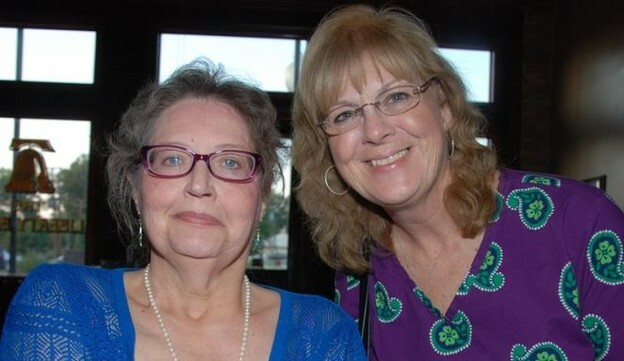 Martha fought this beast cancer for ten years with courage, wisdom, faith, good humor. She was an inspiration to me and to so many others. I will always cherish the times we 'talked' on FB and the wonderful four days together just one year ago as our class celebrated 40 years since our graduation. Martha and I met for lunch in Mesquite shortly before our 35th reunion so she could give me her donations for our silent auction. She donated two of her paintings which were very creative. 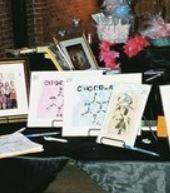 She had painted the chemicals from the periodic table that make up chocolate on a pretty blue background on one and a pink background on the other. I was outbid on both of them. I believe Cindy Greene was the winner. At lunch Martha talked about the good memories she had from being part of the high school band and the positive impact it had on her life. She said it was the best part of school for her. 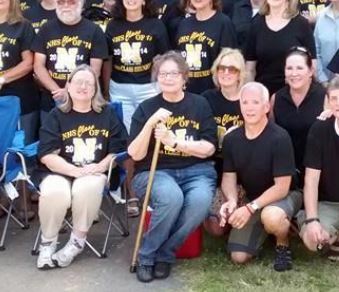 So, I give a "shout-out" to all of the NHS band members and thank you for giving Martha a very fond memory of high school.